The Lodge, Cottages and Rooms at River Ridge Inn are waiting for you and your family or friends. 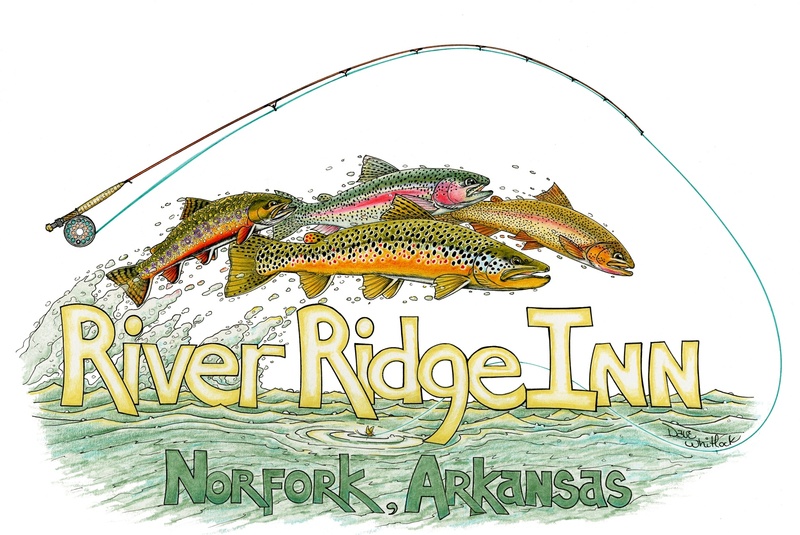 The ONLY premier Fly Fishing destination on the North Fork of the White River (Norfork Lake Tailwaters / Norfork River) in the Heart of the Ozarks. The Lodge, Chalets and Cottages are all on the bank of the North Fork River. The property and The Fly Fishing Academy make for an ideal Corporate Retreat, Family Reunion or just a place to get away from it all. Whether you are a group of twenty, or a single, you will enjoy the beauty and comfort of River Ridge Inn. We will make your stay with us a unique and memorable one. If your desire is to catch "The Grand Slam" (Rainbow, Cutthroat, Brown and Brook Trout), the the North Fork is where you will have to fish. The opportunity is here, the challenge is yours. Our guides, instructors and local fly shops will be more than happy to give you advise, or to provide instruction and guide service on your stay. Take a look at them in the "fishing" section. These guides are "the pick of the litter" along both White and Norfork Rivers. River Ridge Inn is known for its expertise in providing an all inclusive outing to those groups that select one of our fishing adventures packages. Teaching Fly Fishing to groups is what we do. If you came to hike or bike, run or walk, read and relax, sight-see, antique shop, fish or hunt, or have that family get together from relatives scattered all around the country, River Ridge Inn is in the center of it all. Branson is only 1 1/2 hours away.....shows, great shopping and a beautiful drive. The Ozark National Forest has 10s of thousands of acres which are all open to the public for hunting, hiking and biking. Trails start just across the river from the Inn. But it is trout fishing that brings most outdoorsmen and their wives to our Inn. Being located o the banks of the North Fork River and only a couple of football fields to where it joins up with the White River, makes this destination unsurpassed in the abundance of trout water. Walk off our bank and wade out to catch dinner, or opt for catch and release, our preferred result of catching 30...40...or 50+ right out in front of where you are staying. Words are not capable of describing the opportunity you have hear. You need to experience it once. We then know you will be a returned guest just like ver 80 of our annual guests are.